Home Healthcare Solutions, Inc. employs a staff of dedicated caregivers who are thoroughly screened and credentialed, a process that includes a completed application, phone evaluation, personal interview, professional and peer reference verification, extensive background investigations, skill demonstration, initial and annual competency exams, and an evaluation by a Director of Nursing (DONs). Home Healthcare Solutions, Inc. has more than 5 years of experience providing homecare services for adult, senior, and pediatric patients with a variety of conditions. We ensure all homecare services are provided for the entire time they are needed. We require that a care representative who is familiar with your specific needs is available 24-hours a day, seven days a week, so high-quality assistance is always available. Home Healthcare Solutions, Inc. has 7 years of experience providing long-term, continuous care to chronically ill patients. Home Healthcare Solutions, Inc. team, which provides personal care, management and/or treatment of a variety of conditions includes skilled nurses, therapists, medical social workers (MSWs), and home health aides (HHAs). With Home Healthcare Solutions, Inc., children receive the necessary assistance they need at home to have a safe, healthy, and happy childhood. Whether a child needs basic nursing assistance or high-tech therapy, the child’s family can rely on Home Healthcare Solutions, Inc. to provide a healthcare professional that is qualified to perform these vital pediatric services. Companions are available on an as-needed basis, with no minimum time constraints. They ensure your loved one receives the attention and care needed, while delivering the peace of mind of knowing someone is watching over them. Home Healthcare Solutions, Inc. has a dedicated team of homecare providers who care for adults, elderly, and pediatric patients with a variety of conditions including Alzheimer’s disease, cancer, neurological and respiratory disorders and more. © Copyright 2016. 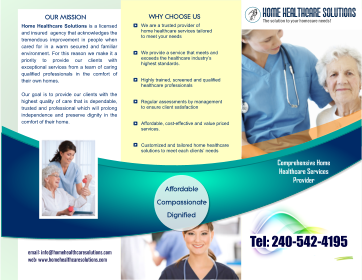 Home Healthcare Solutions. All Rights Reserved.